Join the discussion on our forums! Come discuss Fire Plume Harbinger over in our dedicated Fire Plume Harbinger discussion topic. Battlecry: Reduce the Cost of Elementals in your hand by (1). Good for summoning elementals. Great for making s'mores. even if it reduced the cost of overlord as well it'd still barely be playable. Sad! Play line sounds way too powerful for a 1/1. 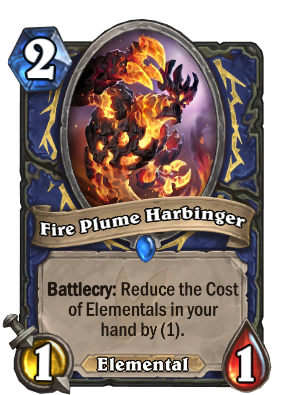 Also Elemental Shaman gets a lot of value from their elemental bonuses so often times they will have tons of card advantage and thus can use that on this card. This card in golden looks so sick! Think it will become more useful if more Elementals come till the End of the year, could prepare a OTK combo like Emporer did. After playing with this card for a bit I have decided that it is weak. You're lucky if you hit 3 things with this. Running 2 in a deck is foolish. If it had Mechwarper stats it would be an auto-include. its obvious the body is weak but its like a ramp + elemental bonus. Card is pretty strong in my opinion. The problem with it is that it's not always ramp. If it was 0 or 1 mana, then it would be ramp, but with the initial investment being 2 mana, you need to have 4 more elementals in your hand to get a 2 mana bonus from playing this card, and just how likely is that to happen? What? When u play wild growth on turn 2 the next turn you can play sth for 4 mana. When u play this on turn 2 then next turn you can play 4 mana elemental, next turn 5 mana elemental. Ofc its not like the REAL reamp but the effect is similar and very strong with shaman elementals. Wild Growth is different though... you actually get that mana crystal advantage until turn 10, whereas here you are just putting in mana early to use it later. You really need to get 4 mana cost reduction in total for it to be worth it. I have played this card a lot since the cards have been released, and you can get sick draws, but only when you have enough targets. I have had games where I just simply ran out of gas, and my early tempo lead didn't matter. The card is interesting - it can get some very powerful elementals out a turn earlier, but the card isn't ramp. And even though that Fire Elemental comes out earlier... remember, your turn 2 basically stunk. Druids have to catch up after a wild growth, and so does the Shaman playing this card too. It's not really ramp though. It's not horrible, but it's not great. It's a small tempo gain in very small windows. You really need 4 targets for it to feel like you did a good play. to make up for the abysmal turn 2. In that way, this card is more like innvervate than wild growth. I'm a harbinger, I cannot lie. I will change the color of your life! I think people are missing the part where you can Coin this out on Turn 1, then play a discounted 3-Drop Elemental on Turn 2. Also, this can allow you to play Servant of Kalimos on Turn 4 where it's more useful on an Elemental synergy curve, instead of Turn 5. What a fair and balanced card. It won't see any real play. Nice to see some Harbinger effect make it's way into HS. Loved the MtG ones during the... I can't remember the block name. A lot of elementals in that one as well, faeries and what not. Instant staple for Elemental Shaman decks! Can't wait to use the elements! It might help with your curvestone, but then again it might end up being so weak you're better off playing a naked 2/3 or 3/2. Shaman is already good with curving, you might want a different 2 drop, considering the loss of tunnel trogg you might need to put up more early pressure. A very cool useful card, but again they give it to Shaman. You play a 2 cost wisp to ramp 2-3 elemental cards by 1 mana, that's very bad. If you get the buff on 4+ elementals then its good. Seems hard to do at turn 2. Agreed, I think this will be a bad card for a while until we start seeing more elementals, especially in Wild. With how defensive the Shaman elementals are, it's not too hard to disbelieve that the turn 1-2 tempo loss can't be made back up, but there just aren't enough of them to be consistent T2 at the moment.